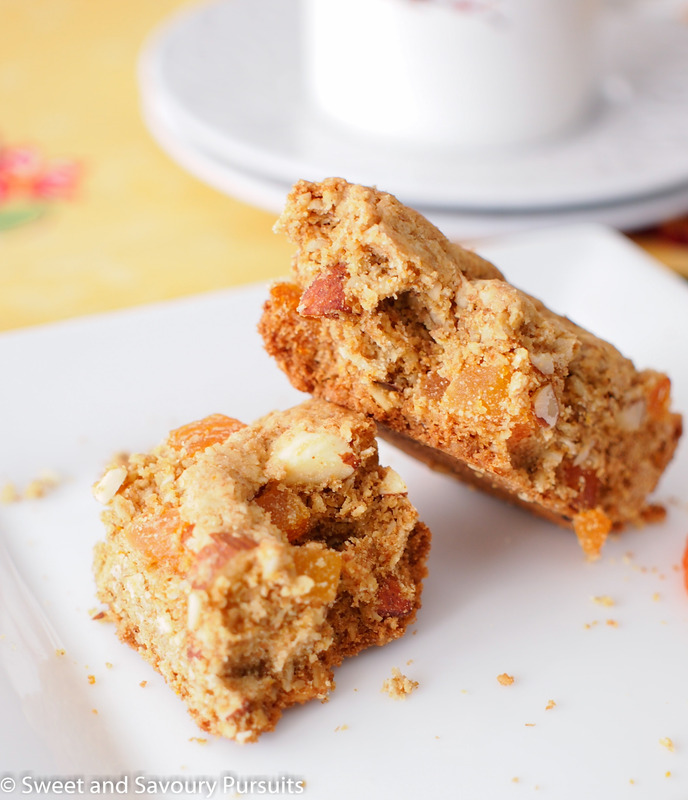 Made with whole grains, nuts and dried fruit, these Whole Wheat Apricot and Almond Bars are great for breakfast on the go. 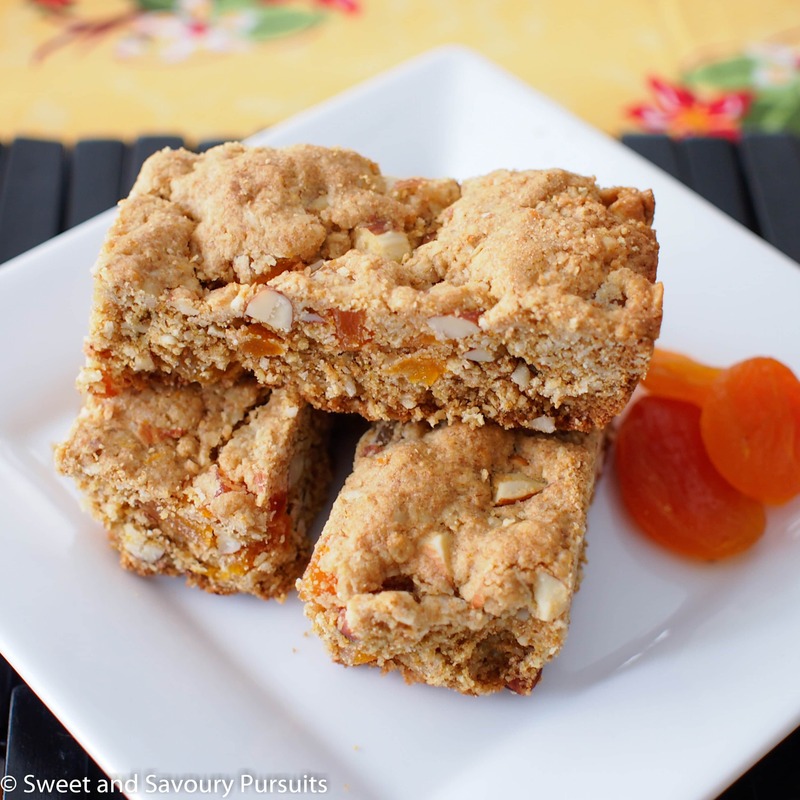 These Whole Wheat Apricot and Almond Bars are great for breakfast on the go. 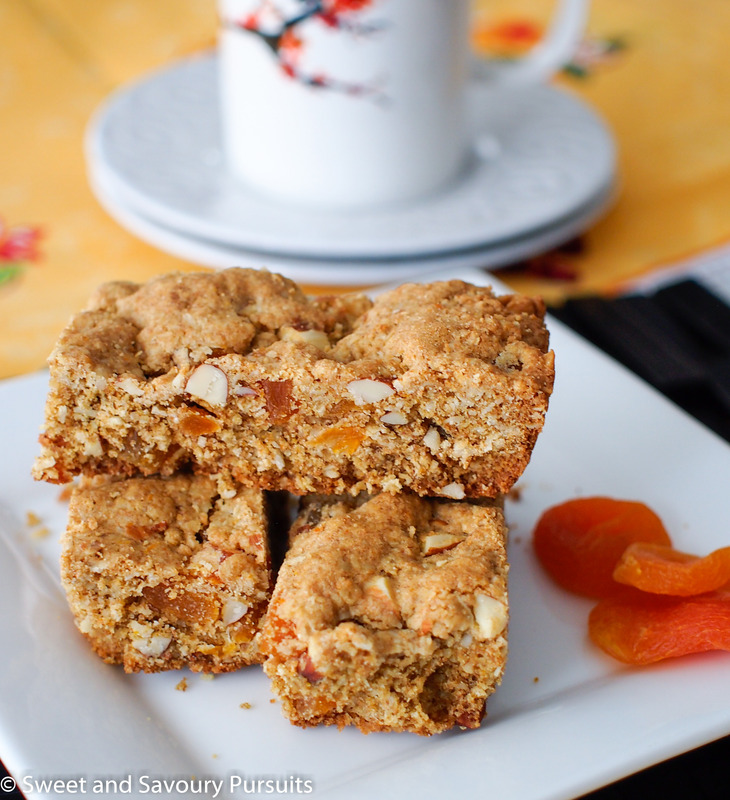 Made with whole wheat pastry flour, oats, apricots, almonds and coconut, they are healthy and delicious. The chopped apricots make them chewy and sweet and the pieces of almonds gives them a nice crunch. The flavours and textures come together nicely to create an excellent bar that is quick and easy to make, perfect on its own and even better with a good cup of coffee. A couple of notes about this recipe: The author in the original recipe calls for a 9×9 baking pan, but when I came to make this I could not find my 9×9 pan, so I ended up using my 8×8. The bars still came out great but a bit to thick in my opinion, so a 9×9 baking pan is ideal for this recipe. In an 8×8, the bars took 25 minutes to bake up nicely, I think that in a 9×9, 20 to 22 minutes would be enough time for them. I also recommend cutting the bars while they are still slightly warm. I found them to be a little crumbly and more difficult to slice after they cooled. In the bowl of your mixer, combine butter and sugar and beat on medium speed until smooth. Add egg, almond extract and orange zest. Beat until well mixed. Add in flour, oats, salt and baking soda. Beat until combined. Add apricots, almonds and coconut. Beat until thoroughly mixed. Spread the dough into the pan and bake for approximately 22 minutes, until top is light golden brown. Let cool for 10 minutes in the pan, and then using the ends of the paper liner, lift out of the pan and transfer on a wire rack to cool a bit more. While still slightly warm cut bars into desired size and let cool completely before storing in an airtight container. I tried making these with dates. They are really good. That’s great to hear! I’ve been thinking of developing a healthy bar recipe with dates. these look so wholesome and good!